How to fix UNEXPECTED_KERNEL_MODE_TRAP BSOD on Windows 10? Home »	Fix » How to fix UNEXPECTED_KERNEL_MODE_TRAP BSOD on Windows 10? Issue: How to fix UNEXPECTED_KERNEL_MODE_TRAP BSOD on Windows 10? Cannot fix UNEXPECTED_KERNEL_MODE_TRAP BSOD for a couple of weeks. It shows up randomly, usually after system's restart. Please provide fixes that I could try. Thanks! 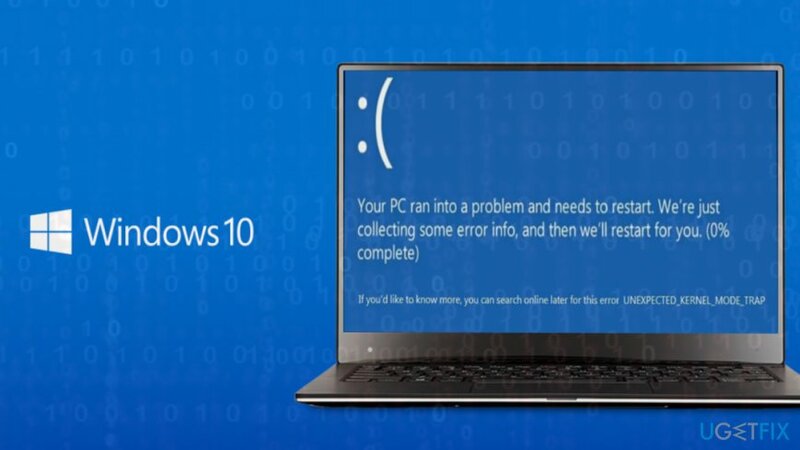 UNEXPECTED_KERNEL_MODE_TRAP is a Windows 10 specific Blue Screen of Death (BSOD) that is typically marked with an error code 0x0000007F. In some of the cases, it may be found as UNEXPECTED_KERNEL_MODE_TRAP_M, though both versions point out to the same problem – the failure of system's driver. Although it may be triggered by hardware failure, driver's incompatibility is a more frequent trigger of a UNEXPECTED_KERNEL_MODE_TRAP error. The problem is that the error does not indicate the problematic driver, which is why we would recommend scanning the system with a powerful PC's optimization tool, such as Reimage to fix driver problems, registry errors, delete unwanted or malicious programs, and other optimization-oriented tasks. If the error you are getting points out to one of the above-listed files, make a research on the file to identify the software that it is related to. This way, you will narrow down the problem. If, however, the BSOD does not contain a reference to a file, try to disable your anti-virus, especially if you are using ESET Smart Security, AVG, Avast, McAfee. Based on people's reports, the UNEXPECTED KERNEL MODE TRAP may occur due to a conflict of the anti-virus. 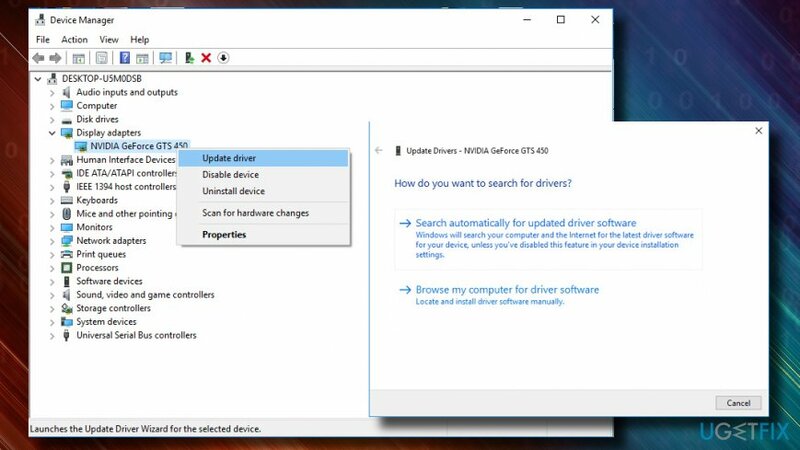 Right-click on NVIDIA driver and select Update driver. Select Search automatically for updated driver software and wait for the update process to be finished. If you get the UNEXPECTED_KERNEL_MODE_TRAP saying “overclocking has failed,” try to remove all overclocking settings. 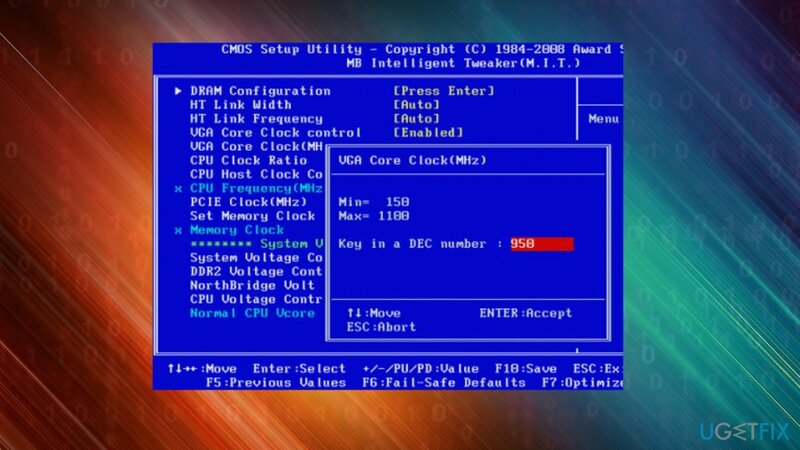 For this purpose, you will have to enter BIOS settings and change the overclocking frequency or set it to auto. If the bug started occurring during system's restart after the installation of Windows updates, it might be that some of the update's components were corrupted during the installation process. Thus, you should remove the update and reinstall it. 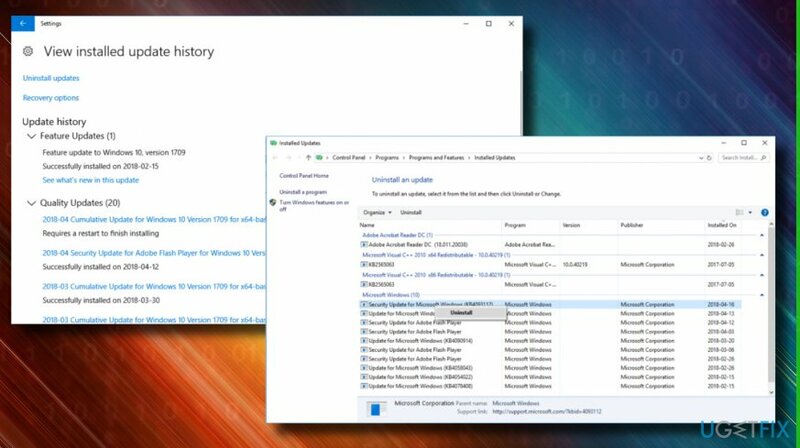 Open Update & Security section and click View installed update history. Once you get a list of installed updates, select the update that triggered UNEXPECTED_KERNEL_MODE_TRAP blue screen. If that did not help, consider reinstalling the driver. For that, you should follow the guidelines given above, except that select Uninstall instead of Update. After that, re-open Device Manager and expand Actions tab. Select Scan for hardware changes. Alternatively, you can download the latest version of the driver from manufacturer's website. ^ Tim Fisher. Blue Screen of Death (BSOD). Lifewire. Practical advice to help you live better with technology. ^ 2-spyware. 2-Spyware. The largest sources of security and tech-related information. ^ Dave James. How to overclock: it's easier than you think. PCGamesN. News, features, guides, reviews and more.